Ever wonder what material both architects and builders love to use in home design? The answer is wood. Why? It is timeless, natural, and inviting. Wood brings the feeling of the natural world into your home. Picture a home with white marble countertops, white tile flooring and white walls. Doesn’t it feel cold and sterile? However, if you add in wooden elements such as wood windows and flooring and mix it with modern touches, such as matching steel appliances and white cabinetry; the result is a feeling of “warmth” in a room. It allows you to experience the essence of nature while in the home. Adding a beautiful texture, such as wood, to your windows can create a spectacular focal point. In this remodeling project, the homeowners selected Milgard® Essence Series® wood replacement windows and patio doors for their kitchen. The prime pine wood was stained to echo the cabinet selection color. The lighter wood flooring gives the eye a place to rest and helps create a warm and inviting ambiance. This series provides any look in the home with a wooden interior, and a strong fiberglass exterior. If you like the idea of using wood in your home, but, have trouble envisioning how it could fit into the design or theme of your home, we hope these examples helped spark your interest. Wood makes a room feel grounded and livable and can be used in all sorts of home styles from clean and contemporary to rustic. Need more inspiration? 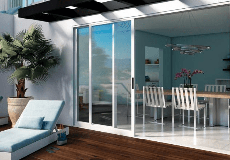 Just visit our Window and Patio Door Photo Gallery. Type the word “Essence” into the search box to see a variety of images depicting different home styles and decorating options. There’s sure to be one that will help you shape the vision you have for your home.